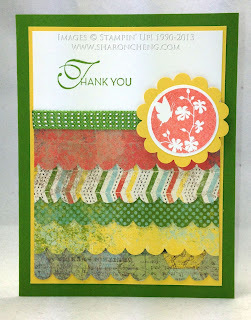 Our May demonstrator swap challenge was to remake a card using products available in Stampin' Up! 's new catalog. 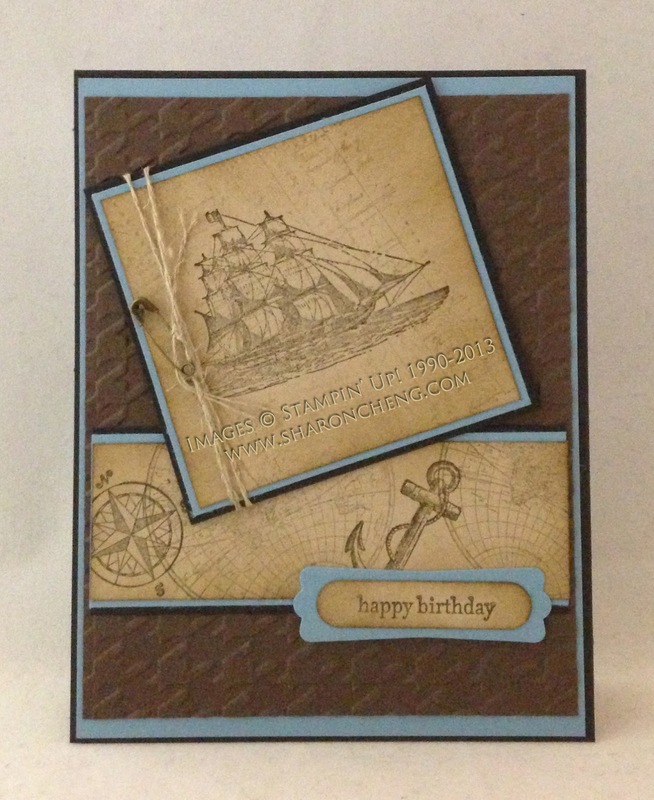 I made this card using the Epic Day This and That Designer Series Paper (130814 $10.95). 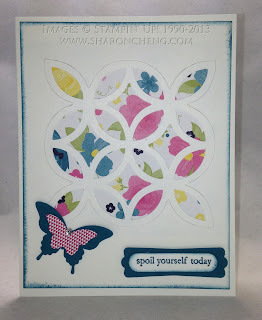 The sentiment is from Lacy & Lovely (122887 $17.95) and the butterfly is from Serene Silhouettes (127324 $17.95). This is the Stampin' Up! demonstrator swap card that inspired the remake. It was made using several retiring products including the Just Believe stamp set (120453 $25.95) and the Comfort Cafe Designer Series Paper (126898 $10.95). Laurel Erb made this stunning card using the Big Shot Lattice Bigz Die (115958 $21.95). The paper behind the Lattice is Gingham Garden Designer Series Paper (129310 $10.95). Layering the Bitty Butterfly Punch (129406 $15.95) and the Elegant Butterfly Punch (127526 $15.95) is a quick way to make a colorful embellishment. 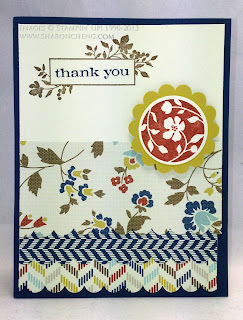 Cindy Peterson made this card using Stampin' Up! 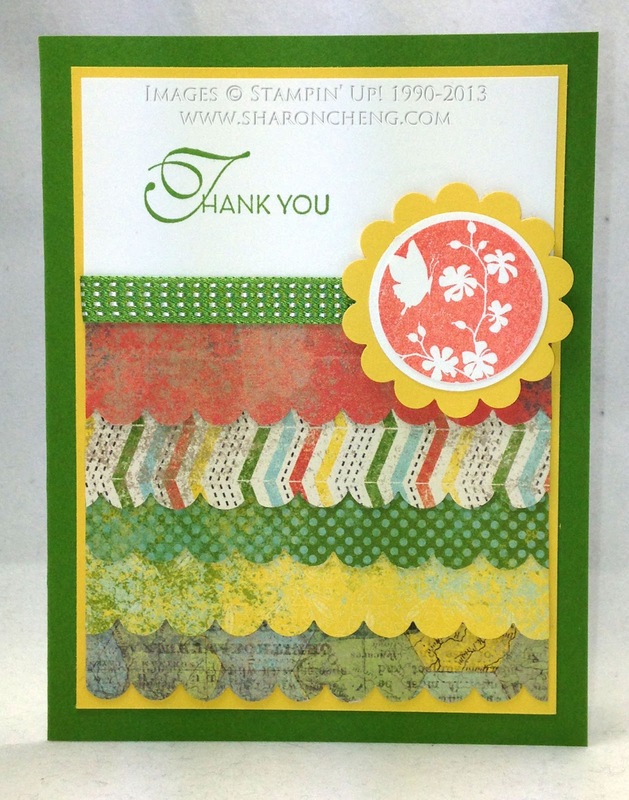 's new Gingham Garden Designer Series Paper (129310 $10.95) and the Really Good Greetings stamp set (130333 $$14.95). See the Melon Mambo flower embellishment? Cindy made that with Stampin' Up! 's Simply Pressed Clay (130685 $6.95) and Buttons & Blossoms Simply Pressed Clay Molds (131272 $7.95). 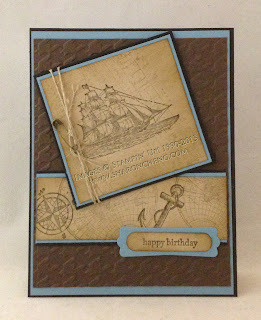 Marilyn Young made this card using the Open Sea stamp set (123032 $18.95). It's a great card that can be used for men or women. The accent using linen thread and one of the pins from Vintage Trinkets (118764 $5.95) is just the right touch for this card. I've posted these swap cards and more on My Facebook Page.